One of my favorite accessories to complete an outfit is earrings. I love all types: funky, elegant, simple, colorful, and especially silver. Mostly I’m easy to please when it comes to a pair of earrings, but I have to be careful with the type of metal I wear because certain ones irritate my ears. With most of my earrings, I have to take them out after wearing them for only a short time. This is especially true with earrings I purchase at inexpensive retailers such as Claire’s Boutique, Charlotte Russe, Target, and Wal-Mart. When Courtney Copeland expressed enthusiastic interest in being reviewed for Stacie’s blog, I jumped at the opportunity. Courtney’s jewelry is very unique; you won’t find anything that even comes close to it in regular stores. All of her jewelry is handmade made of fused glass with lovely color combinations. The specific pair of earrings I chose to review contained pale pink and green blotches with bold wavy black lines running through them. The french hooks are made of sterling silver and did not irritate my skin; I’ve been able to leave them in for a whole day. 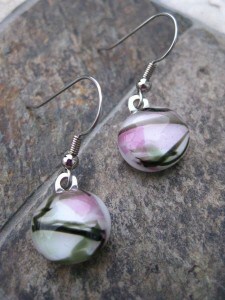 I have been able to pair the pink and green fused glass earrings with quite a variety of items from my wardrobe. A great pair of earrings can be both casual and dressy, and these certainly do the trick! I have worn them with casual tees as well as more dressy collared shirts and business casual wear. The day I received them I opened the package on the playground and some of the older teenage girls on the playground noticed the earrings and wanted to know more about them. I gave one of the girls Courtney’s business card so she could view Courtney’s etsy store to see what else she liked. I wouldn’t be surprised if Courtney gets a few orders right from my own block! In addition to earrings, Courtney’s etsy store features pendants, bowls, plates, and other home accents. Her prices are very reasonable, starting at just $15.00 and currently going no higher than $35.00. The next time you are in need of a unique gift for a friend or family member, be sure to check out Courtney’s latest stock. You’re sure to find something you’ll enjoy! I voted for you on Picket Fences tonight. I love the Fused Dichroic Glass Heart Pendant! She has such cute jewelery! I like the Pink/Purple Dichroic Pendant. I love thevFused Glass Coasters in Teal Cream and Brown…they’re beautiful! I voted for you tonight on Picket Fences. I like the fused glass earrings in green and white. i love her pink/purple dichroic pendant. very pretty shape. 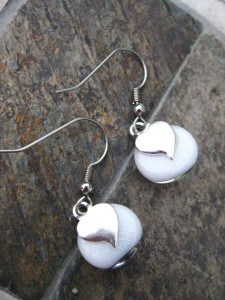 I love the Fused Glass Earrings in green and white. Beautiful. Thanks! Pink/Purple Dichroic Heart Pendant is my fav. I love the fused glass bowl, so pretty! I liked the Fused Glass Pendant Sparkling Blue Dichroic with the star. I really liked the Green and Pink Fused Glass Pendant. Very original and eye catching piece. I like the 6 inch Fused Glass Bowl in Teal Brown and Cream.